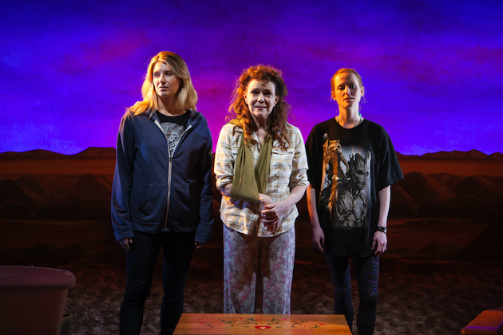 Nadia Bowers, Deirdre O'Connell, and Anna O'Donoghue in The Way West. Photo by Monique Carboni. BOTTOM LINE: Deirdre O'Connell is captivating in this play about a woman and her daughters dealing with major life challenges. If there was ever any doubt that Deirdre O'Connell is one of the best actors working in New York City, head down to Labyrinth where she will school you on creating a character who is both sympathetic and a complete and total mess. As the single mother of two adult daughters—one mostly succeeding in Chicago and the other a deadbeat who means well—she is endlessly proud to be a strong Western Woman, even as she watches her life slipping away. On the verge of bankruptcy after making awful financial decisions including investing what remained of her liquidity into her friend Tressa's business, she learns of the business's (inevitable) demise. Played by Portia, Tressa talks a good game about the endeavor, a therapeutic clinic that uses "essential water" and Saran Wrap as a quick weight loss tool. Obviously it's a scam, and it's no surprise to the audience when it goes belly up. It's this predictability that makes The Way West wander from its otherwise playful and engaging path. There is little surprise to the self-destruction that we witness from this family, as the daughters convene to deal with the financial drama at hand. Manda (Nadia Bowers) seems to have things together, but we eventually learn the apple doesn't fall particularly far from the tree. Meesh (Anna O'Donoghue) is floundering too, dabbling recently in scams which she finds a way to justify. Bowers and O'Donoghue are vibrant in their roles, evoking how siblings can be polar opposites and yet sneakily similar at the same time. In smaller roles, Alfredo Narciso—as Manda's ex-boyfriend Luis—and Curran Connor—as Meesh's current boyfriend Robbie—are perfect enablers wrapped up in the sisters' drama. When Manda asks Luis for assistance going through her mother's files, his arrival provides a brief moment of hope for Manda. Unfortunately for her, the characters only move in one direction in The Way West, and it's not up. Playwright Mona Mansour has created a volatile landscape in this small California desert town, and it's mostly because of Mom's unpredictability. Stylistically, there are moments throughout the play when Mom breaks into a story that she tells to the audience, though her girls sit still and listen, too. She presses play on an old tape player and epic music underscores the tales about the hardships of trekking West and the strong women she envies so much. The playfulness—along with O'Connell's fervent conviction to her storytelling—makes the most compelling case for why we empathize with the character. It serves to soften otherwise egregious careless behavior (like driving a car without the physical capability to do so safely, or leaving lit candles around while dozing). The production design is convincingly cluttered and timeless in a "grandma's house" kind of way (set design is by David Meyer and lighting design is by Bradley King). And there's a lot to admire about a story focusing on women fighting for dignity when life throws you a slew of simultaneous curve balls and the walls literally fall down around you. But since the women are victims of their own poor decisions more often than not, by the end when things are in total disarray I didn't really feel sorry for anyone, except the pizza guy. The Way West is by Mona Mansour. Directed by Mimi O'Donnell. Set Design is by David Meyer. Lighting Design is by Bradley King. Sound Design is by Ryan Rumery. Costume Design is by Asta Bennie Hostetter. The cast is Nadia Bowers, Curran Connor, Alfredo Narciso, Deidre O’Connell, Anna O’Donoghue, and Portia.